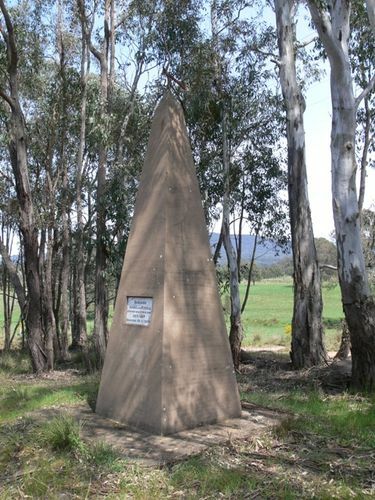 A cairn with arrow commemorates Hume and Hovell who camped in proximity to the monument in their journey of exploration. The Hume and Hovell obelisk erected at Barjarg was unveiled on Saturday by Cr. W. Parsons, president of Mausfield shire. Cr. J. Llewellyn, Rev. J. H. Halford, Rev. G. Brammall, Messrs. G. D. Howe and Carrick also spoke. A picnic and sports were also held and there was a large attendance. Age (Melbourne), 2 December 1924. Erected 29 / 11 / 1924.